Bruschetta is basically an Italian snack delish usually served as an appetizer which can be kept as it is and served or topped with your variations like veggies meat or beans.Shrimp Walnut Cheesy Dip Mayo Bruschetta is one such variation which I am sharing with you all, that makes a use of delicious Cheesy Dip Mayo Variant from Del Monte. 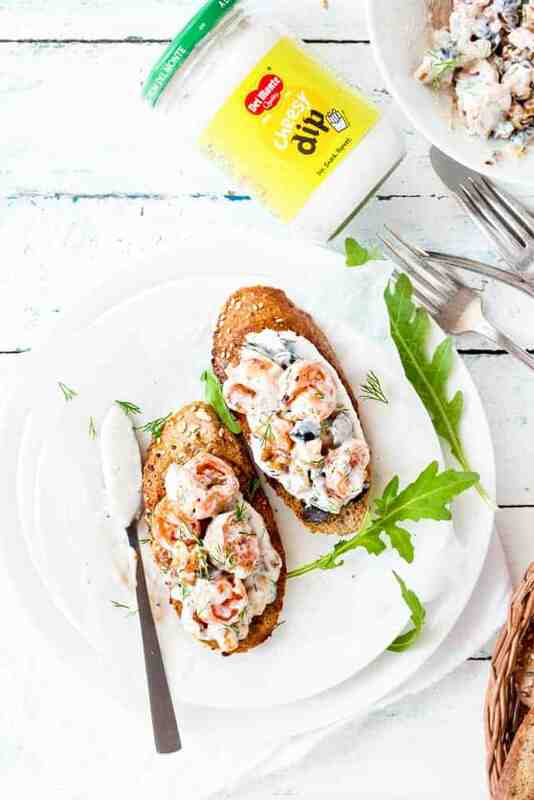 The texture of perfect tossed shrimp, the crunch of walnut, olives, pleasant aroma of Dill, when mingled with luscious Del Monte Cheesy Dip, the flavors will surely pull out the yearn from you and I bet you can’t resist taking bites on and on. 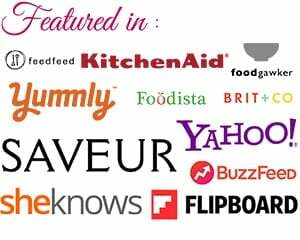 Del Monte Cheesy Dip, makes an amazing cheesy base for Bruschetta with no effort and you have your delightful snack ready in minutes. 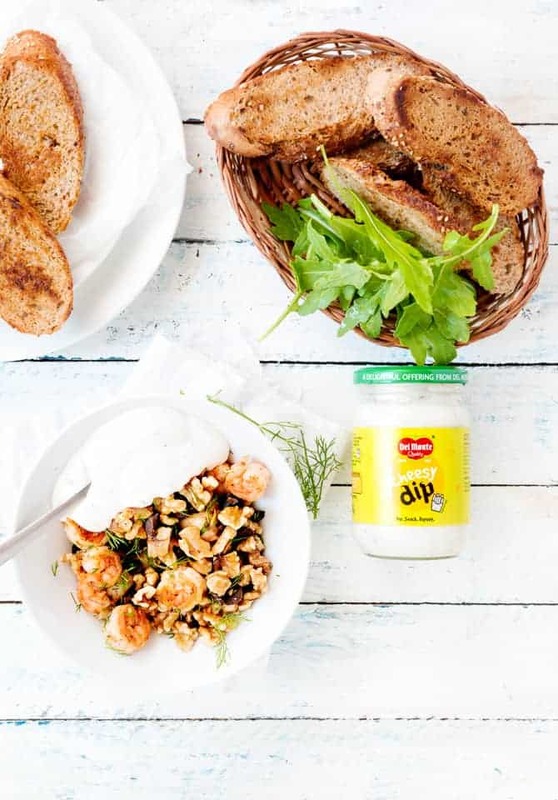 All you need is Shrimp, baguette slices, walnuts, seasoning and the Cheesy Dip from Del Monte. 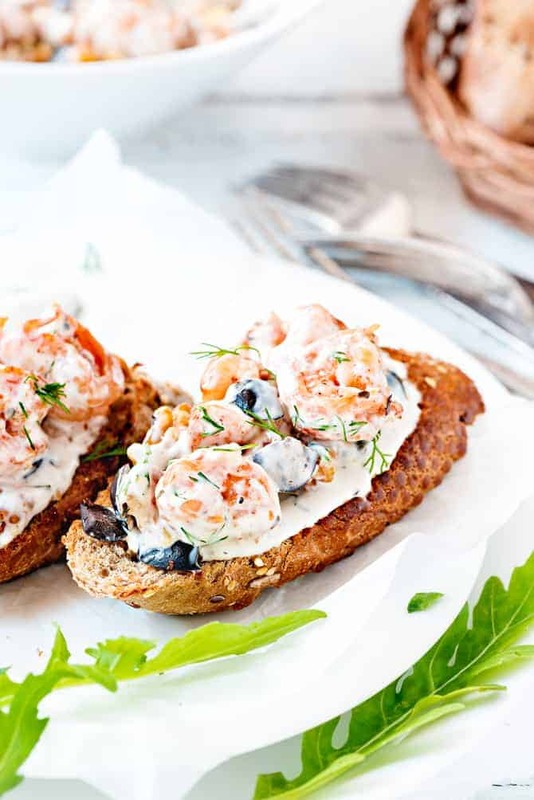 Walnut Shrimp Bruschetta is an ideal chomp for parties, get-togethers, breakfasts or even evening tea. Add shrimps and toss on high for a minute. Cook for 5-6 minutes until nicely seared and done. Season with salt pepper and chili flakes. Take it off the heat. Now, take the baguette slices and smear one side of the slices with Del Monte cheesy dip and top it with prepared Shrimp walnut mayo mixture.